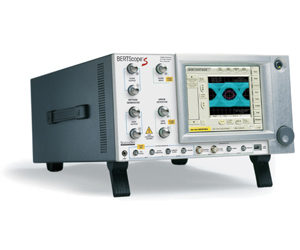 The flagship BERTScope has everything you will need to perform receiver compliance testing and advanced analysis. Featuring easy and flexible stress testing, physical layer analysis such as BER Contour and Jitter measurements, and a new Compliance Contour view for Mask Test, it represents a breakthrough in insight and saved development time. Representing a new benchmark in value, the BERTScope S includes as standard many features that were extra cost options on previous models. In addition, Compliance Contour is a new bridge between BER and mask testing, needed because of the requirements of standards such as OIF CEI and XFP/XFI. These new standards require compliance to masks at BER levels of 10-12, a feat beyond the capabilities of a sampling oscilloscope. BERTScope bridges the gap between eye diagram analysis with BER pattern generation. Finally, bit error ratio detection can be performed fast, accurately, and thoroughly. BERTScope samples data and enables you to easily isolate problematic bit and pattern sequences. Seven types of advanced error analysis are built into one robust solution for unprecedented statistical measurement depth.